There are a lot of books about creatures that have problems with the very thing they should find easy: owls afraid of being in the dark and ducklings not keen on swimming for example. 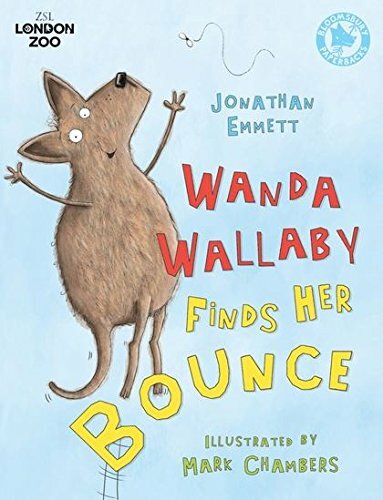 In this book, one of a range produced in partnership with ZSL London Zoo, we meet Wanda, an endearing little wallaby, who lacks a bounce. She is ‘a wonderful walker’ but, of course, a kangaroo should be ‘a high-jumping hopper as well’. A dangerous encounter with a crocodile turns out to be the remedy. Children will enjoy learning about the animals Wanda meets; an anteater, a bat, a mole and, of course, the predatory Australian crocodile. Notes on all of these help the sharing adult answer questions. The repetitious language is well judged for the age group – simple without being banal- and it complements the lively pictures beautifully. A great picture book to enjoy and share.